Attendees learnt how we can support managers and staff to address the common mental health and substance misuse conditions which can lead to problems in the workplace. Our community-based therapeutic team shared details of retention-focused interventions – while our employment and employability projects showed how CAIS can help businesses recruit motivated and skilled staff. We were also able to showcase the expert training on offer from our dedicated Learning and Development department, and the specialist support available through our residential rehabilitation services. CAIS project manager Claire Jones thanked Wrexham County Borough Council’s Business and Investment team for generously supporting the event at Redwither Tower. 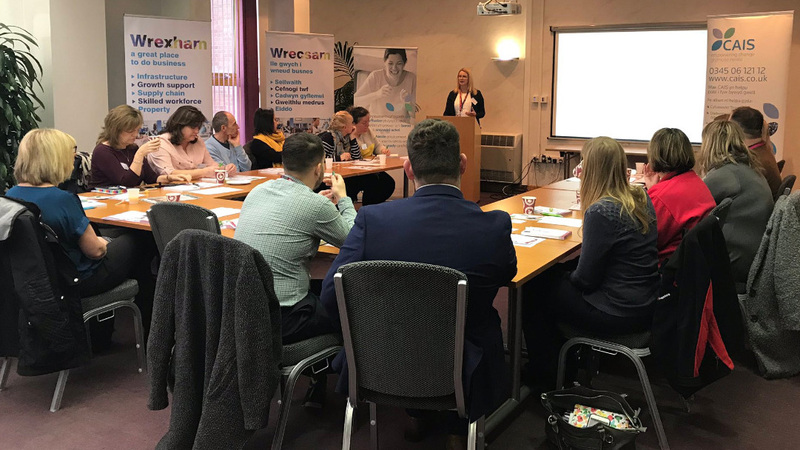 “This was a really valuable opportunity to speak directly to the business community in and around Wrexham, and to showcase the services we can deliver to support workers,” she said. “Responsible employers are well-aware of the workforce challenges presented by mental illness, drink and drugs, and of their responsibilities when it comes to supporting the wellbeing of their staff." “So it was wonderful to share our experience and expertise with such an engaged audience," Claire added. Employers who want to learn more about how CAIS can support their staff recruitment and retention can contact our team by emailing employment@cais.org.uk or calling 01492 523 821. We’ve been helping people into work for more than a decade, and have a great track-record of providing employers with motivated candidates ready to build a new career. CAIS Drug and Alcohol Counselling is for people who are concerned about their own drinking or drug taking or about the drinking or drug taking of someone else (e.g. a partner, parent, close friend or relative).